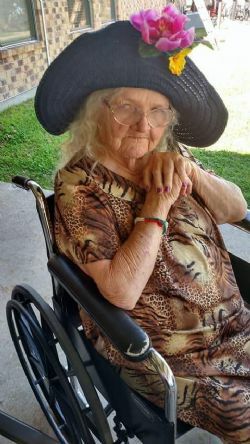 Lola May Allsbrooks, born September 6, 1931 to Roy and Buda Grimes passed away on November 12, 2018 in Corrigan, Texas, at the age of 87 years. Her loving family includes: children, Diana Matthew & husband Joseph, Laura Ferguson, Richard Allsbrooks & wife Candace, Thomas Allsbrooks & wife Amanda, Roy Allsbrooks, Sylvia Dominguez & husband Gabino, Larry Allsbrooks, Louie Nathal Allsbrooks; sister, Geraldine King, Juanita Tolar, Peggy Allsbrooks; best friend, Mary Oleinik; twenty four grandchildren; eighteen great grandchildren & eight great great grandchildren; numerous other relatives and a host of friends. Lola is preceded in death by her husband Louie Allsbrooks; parents; Roy & Buda Grimes; son, Louie Lee Allsbrooks; sister, Mary Jeanette Allsbrooks. She placed her faith in a Pentecost Church of Corrigan, Lola also volunteered at Nursing Homes. Visitation will be held from 4 PM to 7 PM Wednesday, November 14, 2018 at Pace Funeral Home, Livingston, Texas 77351. A Celebration of Lola’s Life will be held at 10:00 AM Thursday, November 15, 2018 at First Assembly of God in Corrigan with Pastor Phillip Corbett officiating. Interment to follow at Carmona Cemetery.